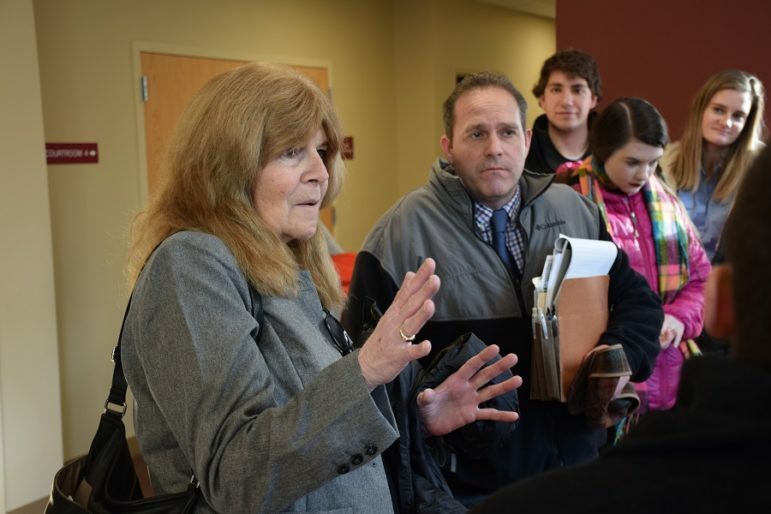 KEENE — Outside of the Cheshire County Superior Courtroom Wednesday afternoon, Keene State College professor Marianne Salcetti looked over to a group of her students and called them the Keene State Five. 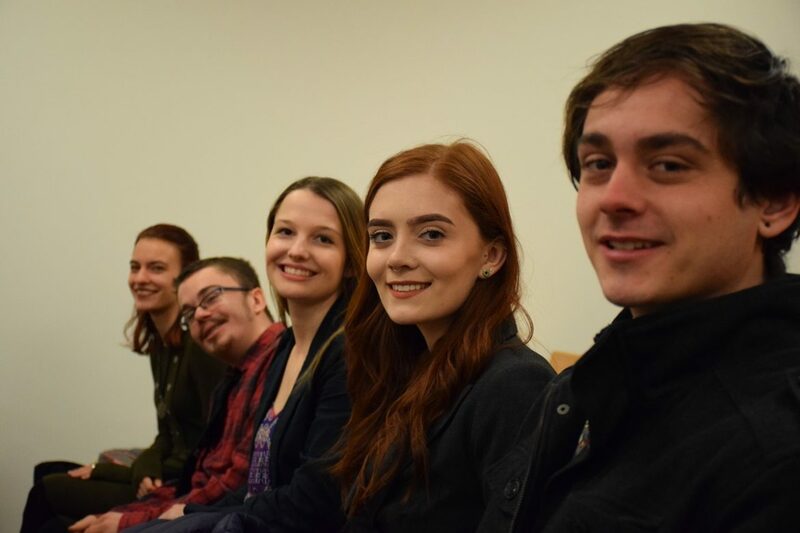 Colby Dudal, Alex Fleming, Meridith King, Grace Pecci and Abbygail Vasas are five students currently in Salcetti’s Public Affairs Reporting class and they are taking the city of Keene to court over what they say are violations of New Hampshire’s right-to-know law, RSA 91-A. All 11 members of the class were at the preliminary hearing Wednesday afternoon for the lawsuit filed against the city, which alleges city staff unlawfully denied right-to-know requests filed by the five students. Salcetti said she has been teaching this class at Keene State College since 2004 and part of what she teaches is how to file a right-to-know request. “We’re not just talking about journalists here. We’re talking about the public. We’re talking about the role of information in a democracy and the access citizens can enjoy to that,” Salcetti said. Ruoff said the law says the city doesn’t have to summarize data and because he doesn’t have the original right-to-know requests he can’t make a determination on if a request was properly fulfilled or not. “I need that. The devil’s in the details,” Ruoff said. Salcetti said she can provide copies of those requests to the court. Keene’s city attorney Thomas Mullins argued on behalf of a motion to dismiss the case saying Salcetti is neither an attorney nor one of the five plaintiffs and therefore should not be representing the case. Ruoff said he can make an exception to that court rule. Mullins also argued that the five requests were submitted to different departments and varied. Ruoff also offered to separate the cases. “I don’t want to complicate it any further your honor,” Mullins said declining the offer. 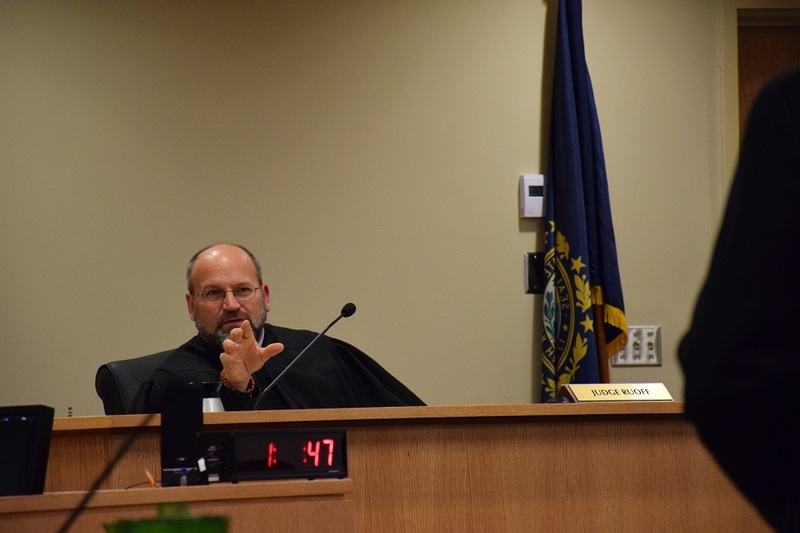 Ruoff said he will schedule a hearing for the case in late January or early February and suggested both parties could work the issue out amicably outside of the court before that. 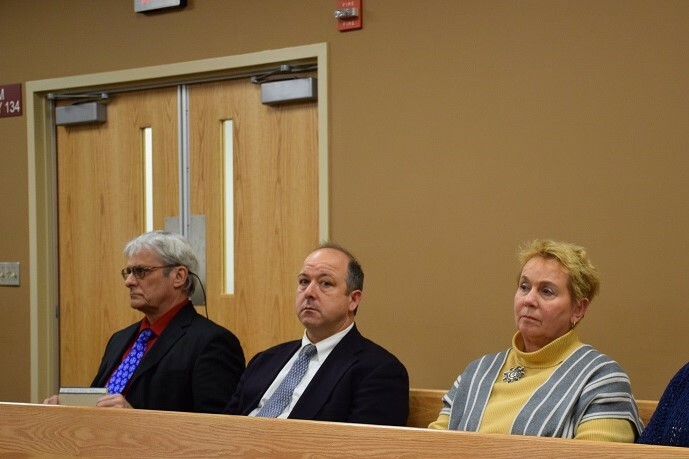 Keene’s city attorney Thomas Mullins and other city staff — records manager/deputy city clerk William Dow and city clerk Patty Little — attend the first hearing in Cheshire County Superior Court in answer to a lawsuit accusing city staff of denying right to-know requests. Mullins added that if information is readily available and can easily be pulled from one data base, the city will do so. “If we can go to one data base and pull that information, we tend to do that,” he said. Mullins also said requests for information on restaurant health inspections hit a snag because that city information was in the process of being switched over to a new system. “That information may be more readily available now,” Mullins said. Ruoff referenced the case between the ACLU and the city of Manchester over requested photographs city police officers had taken, saying that having to take information from more than one data base or particular information from one data base was not considered in that court decision compiling a report. Journalism major Fleming said outside of the courtroom he had requested information on the arrests and charges the city of Keene makes for minors in possession of alcohol and party host liability laws. “I figured this is a college town, a lot of people drinking, a lot of underage people drinking — seeing how much they charge people and how much the city brings in through that,” Fleming said, adding he thought it would be interesting to compare Keene’s revenue from such arrests to other cities. “I submitted to the city clerk William Dow and he rejected it on the grounds that there’s no report written about those two laws. So instead of getting any information about it at all I have to request a specific report,” which the city doesn’t have so that request is also denied, he said. The other four students hit similar obstacles when requesting public information such as requests for city records on police brutality and sexual assault cases. Dudal and King made separate, but complementary requests for more details about the results of city health inspections in Keene restaurants. The requests were attempting to get specifics such as why a restaurant failed an inspection or why one passed. According to David Taylor, vice president of Right to Know New Hampshire, this type of information about restaurant inspections is readily available from the city of Manchester. Taylor said in a phone interview Wednesday evening that he had reviewed the court filing two days ago and while on the surface the argument is strong, he did not see any supporting documents, which are important in such cases. He added Salcetti and her students are legal novices who are representing themselves in court. Salcetti said after the hearing Wednesday she has already spend more than $300 of her own money to file the lawsuit and emphasized the court action is not backed by Keene State College. “The college isn’t paying for any of this. This is all coming out of my pocket,” she said. She said she has never brought a right-to-know case to court before, though she has taught this particular class for 30 years in three different states. The other students in the class made right-to-know requests with the state and with Keene State College without meeting this “volume of roadblocks,” she said. “I hope this does open a discussion on what are records, what is information, what are files, what is data. And I think it’s a good discussion to have in New Hampshire because the information belongs to all of us,” Salcetti said. Bringing a right-to-know case to court is expensive, complicated and intimidating, Taylor said, which is why most people don’t do it. There were several inconsistencies in the way Keene staff handled these right-to-know requests, Taylor said. For instance one was denied for lack of a signature while the four others weren’t. That goes against what the New Hampshire Attorney General’s Office says about how the law should be handled by government officials, he said, adding an individual doesn’t even need to give their name to make a right-to-know request. However Taylor echoed Ruoff’s sentiment that the ‘devil’s in the details,’ saying all correspondences between the students and city officials should have been kept and then filed with the lawsuit. Taylor added he hopes those records exist. Taylor said a right-to-know commission held this summer in New Hampshire made a recommendation that an ombudsman position should be created to handle these types of alleged violations. Under the current state law taking a city to court is a citizen’s only recourse, he said. “My concern about the case is that this is something that the ombudsman position would be really ideal to deal with,” Taylor said.